AVAILABLE NOW at POINT 262 CONDOMINIUM: ---BRAND NEW CONSTRUCTION Completed end of 2018! Be the First one to live at this MODERN & LUXURY 731 Sqft 1 Bedroom 1 Bathroom with 61 Sqft PRIVATE BALCONY & 1 ASSIGNED UNDERGROUND PARKING GARAGE SPACE (Compact Space). ---UNIT FEATURES: High-end Finishes, Professional-grade Stainless Steel Appliances, Gas Cooking with Vented hoods, Hardwood Flooring, Bathroom with Radiant Heat Flooring, Tankless water heater provides unlimited instant Hot Water, Water included in Monthly Rent and Washer/Dryer in Unit. ---BUILDING FEATURES: Beautifully Landscaped Common Roof Deck plus Green Terraces, Dedicated Bike Storage, Fitness Room and Part-time Concierge round out the Amenities. 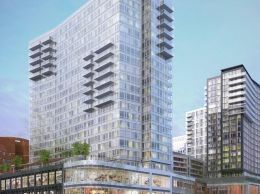 ---AREA AMENITIES: Shaws Supermarket & Twin its Plaza right in front, Minutes to Lechmere T GREEN LINE, NorthPoint Park at CambridgeCrossing for all of your Outdoor Activities; Running or Biking along Charles River, easy access to Cambridgeside Galleria Mall, Shops & Restaurants.